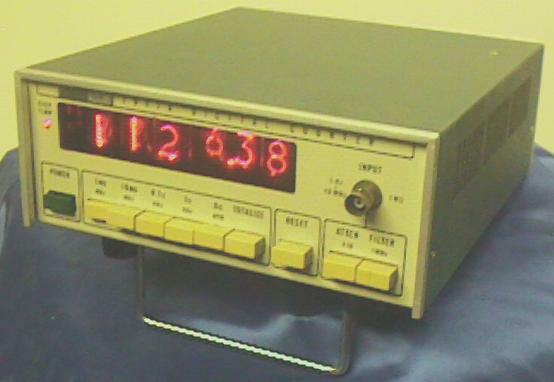 This clock was converted from a not-quite-working Fluke 1941A frequency counter, manufactured in 1974. It measures about 8" wide, 3.75" tall, and 9" deep. A fold-down stand on the bottom can be used to raise the front an additional 1.5". It weighs 4.75 pounds. The device uses six ZM1000 Nixies, plus a single red LED to indicate overflow. In its converted form, it displays the time in either 12- or 24-hour format. It can also display the date at the touch of a button, in any of three formats, and has a stopwatch mode with a range of 100 hours. Click here for the clock's instruction sheet (in Acrobat PDF format). Here's a picture of the inside of the clock. The buyer requested a greater reserve power capacity than is practical with the supercapacitor backup I normally use, this was implemented with three AA batteries. The battery holders were mounted on a ball bearing slide (from an old under-desk keyboard drawer), which is shown in its extended position in this picture. This allows the batteries to be changed without opening the case. The bottom circuit board (only a little of which is visible here) is mostly unused now. However, it acts as the mechanical support for the front panel buttons and the display board, so it couldn't simply be removed. The middle board, on which the Nixies are mounted, also contains counter/driver circuitry that I was able to use. The only significant modification I made was to break the carry chain in two places, so the board acts as three 2-digit counters instead of a single 6-digit counter. The protoboard on the top of the stack contains the power supply and control circuitry I added to convert the device into a clock. 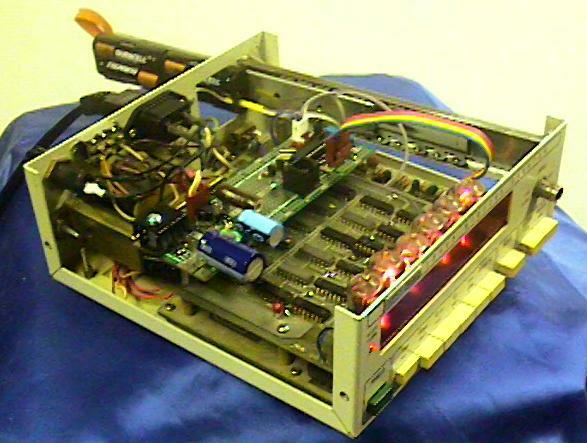 The microcontroller is a PIC18LF1220, using 896 bytes of program ROM and 19 bytes of RAM.